Home My sewing worldSewing & life	Debunking 5 fears and myths about sewing! Sewing is not hard! Of course some projects are more complex, for instance sewing a jacket or a shirt up, however there are a lot of very simple and fast projects that everyone can do right from the start. Everything you don’t know seems complex in the beginning , but I can assure you that once you get the hang of it everything will seem much easier and you’ll wonder why you hadn’t given it a try before. I always wonder the same! 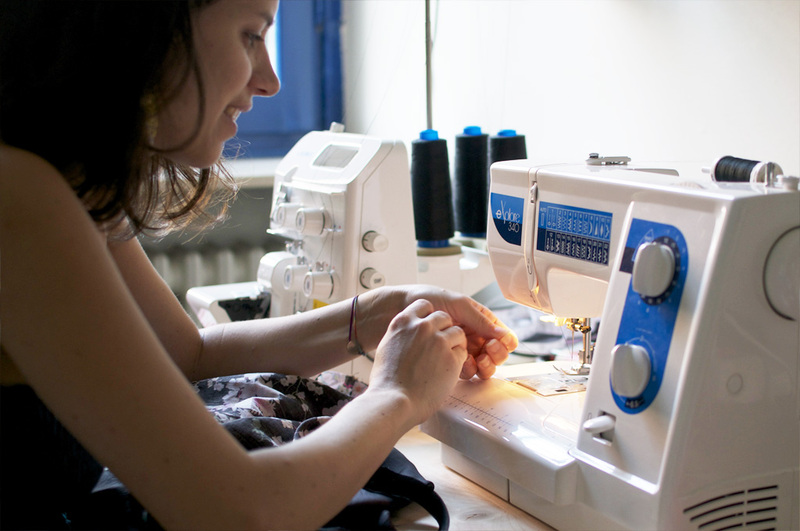 All you need is to have a sewing machine (our moms or grannies will be very happy to let us train with theirs; alternatively you can turn to a specialised shop), a basic kit (Ikea’s is perfect! I’ve used it for a long time and it contains all you need to start), a project (easy if possible, at least in the beginning!) and a lot of will to learn. On the net you can find every kind of tutorial, even to understand how to turn on and use your sewing machine (have a look at Tilly and the Buttons blog, I used her tutorials to get started too). If you don’t want to learn on your own, you can instead attend sewing classes. Anyway, if you have managed to use your electrical household appliances, a camera, a smartphone, you can easily learn to use a sewing machine too! A lot of friends of mine tell me that they are not cut out to working with their hands. Actually it’s only a matter of how fast you manage to get handy without getting discouraged. Who is more used to doing small jobs with theirs hands, surely will take less to reach a certain familiarity, but everyone can do it (remember that all our grannies knew how to sew)! It’s a matter of practice and training…it only depends on how much you want to learn and how much time you are willing to dedicate to it. And here it goes the main problem: I’ve no time! By now organising our lives in order to fit our engagements together is a mess, let alone finding the time for a new hobby. For me it’s the same! However I can assure you it’s not an activity that necessarily takes too much time, only a bit of organization. You don’t have to churn out dresses every week, you can sew only one or two hourishs in the evening (same time of watching a movie for instance) from time to time and learn little by little. I took two months to make my first dress, carving out time late in the evening. Just don’t have to rush it! Nothing can be learned overnight. If you think that garments in shops are more beautiful than those you can make yourself, you’re making a big mistake! Once you learn to sew you’ll pay more attention to fabrics, fitting and seams of garments in shops and you’ll realise that all that glitters is not gold. You’ll learn to recognize well done garments from those that are not worth buying. Furthermore, with a bit of practice and the right tools, you’ll start to make dresses that are in no way inferior to many of the ones you find in the windows. You can choose the one that fits you better on you and, above all, the fabric you like most. Not to mention the satisfaction of wearing a dress made by yourself. In short it’s worth thinking about it, even only to train ourselves to go shopping more selectively and recognize the beauty. If you think about sewing, a granny that sews unfashionable dresses, curtains and tablecloths comes to mind. Actually sewing is very far from this stereotype by now and it’s become a trendy hobby. A lot of girls from all over the world have embraced the DIY (Do it Yourself) philosophy even in fashion. There is a huge online community of bloggers and sewing lovers that post their creations, support each other and strike up a friendship. You can draw inspirations from the style of girls who’ve learned to sew and have a hole wardrobe full of garments made by themselves. Not to mention websites that offer indie patterns and fabrics with amazing graphics. In conclusion, you can also find a lot of inspirations in the sewing and DIY world, not only on fashion blogs (if you don’t believe me, have a look to some of the inspiring sewing blog I follow. Find the list on the right column). So if you want to try it, give it a go! In my opinion the secret to learn to sew your own dresses is simply be curious, be willing to experiment and, above all, have fun! Italian sewing Meet-up and DIY Fashion at Abilmente 2015! Hi! I just found your blog and I just started sewing 4 weeks ago. I decided to take classes once a week, but I feel like the classes have helped me to lose fear of my sewing machine and understand some things, but the bulk of what I’ve learned is in tutorials I’ve seen online and practicing on my own. Thank you for creating this and inspire other beginners such as myself to persevere! So far I have done two very basic maxi skirts and last night I ventured into printing a pattern and trying to do a pair of simple elastic shorts for my husband. I know my projects don’t look as good as they could but I do feel a sense of pride with what I can do and I’m motivated to keep on practicing and learning. Greetings from Mexico! Hi Yaz! 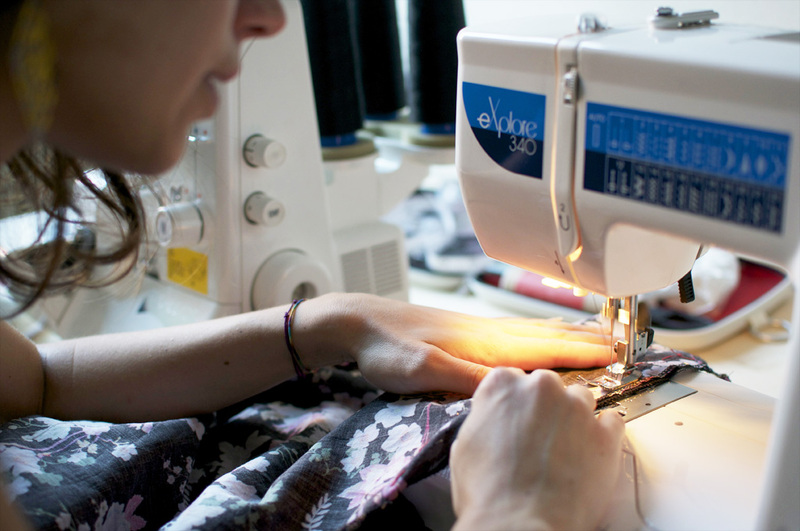 Yes, practicing on your own is definitely essential to improve your sewing skills. Taking classes is important, I’ve learned a lot, but practicing on your own (and often, very often, making a mess) is the best way to understand how things work. And it’s so exciting, you’ll learn something new every project you make and your garments will look better and better, you’ll see. So keep going! This is a great post and like Mia, this was me before I learnt to sew, apart from considering it uncool as I used to do cross-stitch and my mom and nan did lots of sewing, knitting, etc. For me, joining a sewing class was the best way to learn as I’m not sure I would’ve picked it up by myself. I just wish I’d learnt from my mom and nan when I was younger! Yes, dressmaking really makes me scrutinise ready-to-wear clothing, and I rarely but them these days; the fabric might win me over if I know I’d struggle to find something that nice. Oh and another positive with making your own clothes, is there is almost no chance that someone will be wearing the same as you! I loved this post! I felt all of these things before learning how to sew. When I finally started, I just wished I’d had the courage to start earlier! I’ve been sewing for about a year now, and while I still consider myself a beginner, I’ve been able to make some simple pieces of clothing that I love more than anything I’ve bought in stores. Sewing has also changed my relationship to shopping for the better. I think I could have avoided a lot of shopping addiction, wasted money, and frustration about fit if I’d started sewing earlier.